I hate to break it to you, but a gun is absolutely useless for self-defense if you don’t have any ammo for it! Well, I guess the gun isn’t completely useless. You could bluff and pretend there is ammo in it. Or you could smack someone on the outside of the head with it. 😉 But let’s all agree that a gun is going to be a LOT more effective if you’ve got ammo for it. As a general rule, you should stockpile 2,000 rounds of ammunition per caliber. More modest estimates put the number at around 800 rounds. Some preppers also give the smart advice of choosing firearms which use less-common ammunition because it will be easier to find. But I don’t want to talk about how much ammo to stockpile. I want to talk about how to find ammo when SHTF and you’ve run out of ammo, it’s been stolen from you, or you simply can’t get to your stockpile. I legally need to include a disclaimer that I am NOT recommending that you steal anything! 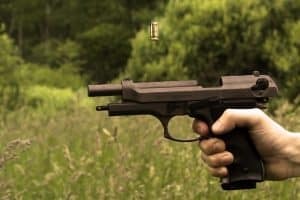 I’m talking about total SHTF situations where you have run out of ammo for your gun. Even in those SHTF cases, I still wouldn’t recommend stealing ammo. Because who the hell are you going to steal the ammo from? Obviously it will be someone with a gun – and you don’t want to steal from someone who could shoot you dead! But stealing ammo is still an option. You might want to work on you lock-picking stills and learn how to sneak into places without being seen. When SHTF, money will no longer have any value and bartering for goods will be the new currency. While none of us can predict for sure what will happen, I’m guessing that ammo is going to be the new gold in this SHTF economy. It will take a LOT of goods to barter for even one cartridge! Even if you think you have stockpiled enough ammo or aren’t worried about it for some reason, it still is a good idea to stockpile some bartering goods. You never know what item you might end up needing and having surpluses for bartering could help you out there. First off, I need to point out that the terms bullet, ammo, and cartridge are often incorrectly used – even by firearm owners. When people say “bullet,” oftentimes they really mean cartridge. When you fire, the primer is expended and sets off the powder which causes the bullet to come out of the barrel. Casings can be used numerous times because they usually remain intact. However, you will need to replace the primer, powder, and bullet each time you fire your gun. This said, it is possible to make your own ammo. When a bullet comes out of the gun, it will be too deformed to be reused as it is. Instead, you need to melt the bullet down and cast it. Of course, this is assuming that you are able to retrieve the spent bullet at all! What if you can’t retrieve the spent bullet? One solution is to find scrap lead and melt this down to cast. Tactical Review has a great video on how to do this using lead tire weights. In Part 1 of the video, he melts the lead into ingots. In Part 2 of the video, he casts the lead into bullets. In Part 3, he shows how to prep the cast bullets for reloading. If you think you will need to make your own ammo when SHTF, then you should stockpile primers. However, it is impossible to make your own ammo primers. I really love this video from Jon which shows how to reuse spent primers. 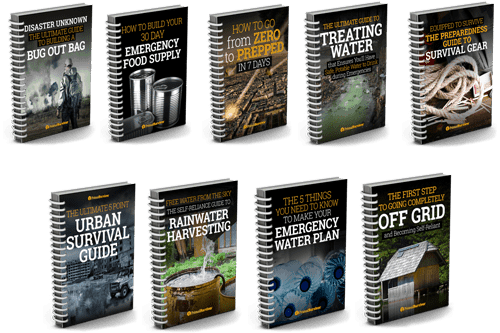 Be warned that this may be dangerous to try and should only be used as info for SHTF planning! You can also check out this great 17-page long guide on How to Make Your Own Primers from Aardvark Reloading. Here is where things get really tricky with making your own ammo from scratch. You’ll need to have gun powder. It is possible to make your own Black Powder – which is the traditional gun powder used by our forefathers. I’ve got to be honest here. I am really queasy about the idea of making my own black powder. The stuff is explosive. 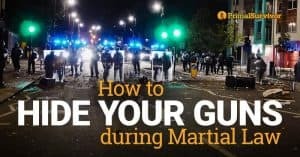 Even if you just want to practice making it a few times for SHTF planning, it might be illegal to make. So don’t be rash or do anything stupid. Do your research before trying to make explosives like black powder! Of course, the question is where the hell will you get these 3 black powder ingredients when SHTF! I’m not trying to be discouraging, just realistic. If you are serious about ammo security for SHTF, then you’ll probably want to stockpile lots of powder so you can reload ammo. Again, be warned that powder is explosive so check the laws about how much you can keep at your home. This video is a good starting point for how to make your own black powder. And this article has good information about using black powder in modern firearms. Now that you’ve got your bullet, powder, primer, and casing, you are ready to reload! A complete ammo reloading kit will probably cost you about $400. If you fire practice rounds regularly, it might be worth it to get one of these. Most people who reload ammo do so to save money. However, if you are really concerned for SHTF, then this might be a worthy investment for your safety and security. Here’s a good guide on reloading ammunition to get you started. 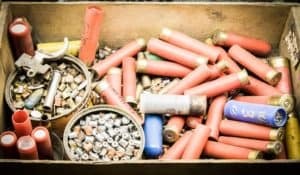 How much ammo do you think should be stockpiled for SHTF prepping? Have you reloaded your own ammo before? 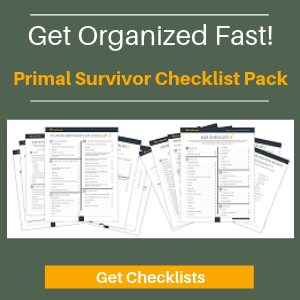 Join us in the Primal Survivor Facebook group for more prepping talk and tips! To get a basic reloading press with most of the essentials, except the dies, Lee makes a mostly complete kit for around $150.00! And Lee dies are around $26.00 each for the common ones(9mm, .38. .40 S&W, .223, etc. ).One more thing; most preppers give advice to have weapons in VERY common calibers. Finding, say, .257 Roberts when the SHTF is ludicrous! I was at a state wildlife gun range early last month and I was amazed at how many unspent intact cartridges I found. Especially in the casing recycling buckets. Course you don’t have a lot of control over the caliber and types of ammunition you might find but it could be another source. Another and hopefully you won’t find too many of these would be scrounging around combat zones. One more thing you might want to pick up is a reproduction of a Flintlock Kentucky long rifle or a flintlock pistol. Historically when percussion cap muzzle loading Firearms first came on the market there was resistance because it’s more difficult to find caps then just charging the pan of your Flintlock. 1. Scavenging ammo from abandoned homes is not stealing. Also remember that many businesses that handle money have a gun(especially grocery stores, a shotgun) in their main office. Ammunition is in a lot of places you might not expect, and it is really the best currency in a world gone mad. Especially .22 rounds, best small game rounds there is and the most accurate. 2. Well said that it will be hard to barter for ammo, especially if you don’t have any to begin with. That said the best things to barter with will be liquor, medications, and prescription drugs. At some point someone will run out of TP and get real anxious! Stock up on what everyone depends on, but didn’t think was really important. 3. Don’t count on making your own ammo unless you already know how to do it and make it work. It takes a lot of time to understand the compression ratios of propellant and round sizing that make a successful round work. Plus, it all comes down to the cap. If you can’t make a fulminated mercury cap to reload your centerfire casing with then all your effort is wasted. All this is why I bought plenty of rounds for my .22s, but I bought thousands of pellets for my Ruger Air Rifle, and hundreds of bolts for the two small crossbows. All excellent points Mark. Especially #3 not a skill that would be easy to pickup without prior experience.